Amazingly, there are still new species of sharks and rays being described by science on a regular basis. In some cases they have been well known for a while (e.g. the Western wobbegong) but no one has gotten around to describing them. More exciting is when a deep water trawl or a lucky diving expedition uncovers a species that the scientific community was completely unaware of. This page on elasmodiver.com highlights the discovery of some of these species. Many thanks to Helmut Nickel who somehow manages to find out whenever a new species is described and diligently informs the rest of the lay community of shark fanatics through the Shark-L web forum. Without his input I wouldn't have a clue. If you have information about a species I have overlooked please email me the information and I will add it to the list. Victoria E. Vásquez, David A. Ebert, & Douglas J. Long. ABSTRACT: A new species of lanternshark, Etmopterus benchleyi n. sp., is described from eight specimens collected off the Pacific coast of Central America at depths ranging between 836 and 1443 meters. The new species is placed in the Etmopterus spinax clade by a lack of flank markings and the moderately short, slender, hook-like, conical dermal denticles distributed over the body. It can be distinguished from its closest congeners based on a combination of coloration, proportional body measurements, meristic counts, arrangement of dermal denticles, and size at maturity. The dorsal fins of the new species are either similar in size or the second dorsal fin is slightly larger than the first vs. the second dorsal fin distinctly larger than the first in E. granulosus, E. princeps, and E. litvinovi. The pre-oral length is shorter in the new species (6.9–9.0% TL) than in its closest congeners, E. granulosus (7.9-11.3% TL) and E. princeps (9-10% TL). The tooth count in the lower jaw is higher in E. benchleyi (30–36) than in E. granulosus (28), but lower than in E. litvinovi (40–50) and E. princeps (40–50). Photophores in E. benchleyi are sparse compared to other etmopterids and difficult to identify due to its uniform black color. This new species is also distinct from other members of the E. spinax clade in having dense concentrations of dermal denticles closely surrounding the eyes and gill openings. E. benchleyi is the only Etmopterus species presently known from the Pacific coast of Central America. Journal of the Ocean Science Foundation 17: 43-55. Abstract: A new species of chimaeroid, Chimaera carophila sp. nov., is described from 37 specimens collected from deepwater slopes and seamounts around New Zealand. The new species is distinguished from its closest congeners, Chimaera fulva Didier et al. 2008, Chimaera macrospina Didier et al. 2008, and Chimaera obscura Didier et al. 2008, by its uniform pale-brown coloration, geographic distribution, and a combination of morphological characters, including longer dorsal and ventral caudal fin bases, a shorter first dorsal fin height, a shorter dorsal fin spine, and shorter claspers that are divided distally for one-third of their length. Chimaera carophila sp. nov. also can be distinguished from closely related species in New Zealand and Australian waters based on DNA sequence divergence of the NADH2 gene. Comparisons of body size in a large sample of specimens show considerable overlap in character ranges among congeners making species distinctions difficult. New combinations of morphometrics are suggested including ratios of head length to eye length and dorsal spine length to head length, to better distinguish among species of chimaeroids that are similar in overall appearance and size. Also, a key to New Zealand and Australian Chimaera species is provided. The morphology and phylogenetic relationships of a new genus and two new species of Neotropical freshwater stingrays, family Potamotrygonidae, are investigated and described in detail. The new genus, Heliotrygon, n. gen., and its two new species, Heliotrygon gomesi, n. sp. (type-species) and Heliotrygon rosai, n. sp., are compared to all genera and species of potamotrygonids, based on revisions in progress. Some of the derived features of Heliotrygon include its unique disc pro- portions (disc highly circular, convex anteriorly at snout region, its width and length very similar), extreme subdivision of suborbital canal (forming a complex honeycomb-like pattern anterolaterally on disc), stout and triangular pelvic girdle, extremely reduced caudal sting, basibranchial copula with very slender and acute anterior extension, and precerebral and frontoparietal fontanellae of about equal width, tapering very little posteriorly. Both new species can be distinguished by their unique color patterns: Heliotrygon gomesi is uniform gray to light tan or brownish dorsally, without distinct patterns, whereas Heliotrygon rosai is characterized by numerous white to creamy-white vermiculate markings over a light brown, tan or gray background color. Additional proportional characters that may further distinguish both species are also dis- cussed. Morphological descriptions are provided for dermal denticles, ventral lateral-line canals, skeleton, and cranial, hyoid and mandibular muscles of Heliotrygon, which clearly corroborate it as the sister group of Paratrygon. Both genera share numerous derived features of the ventral lateral-line canals, neurocranium, scapulocoracoid, pectoral basals, clasper morphology, and specific patterns of the adductor mandibulae and spiracularis medialis muscles. Potamotrygon and Ple- siotrygon are demonstrated to share derived characters of their ventral lateral-line canals, in addition to the presence of angular cartilages. Our morphological phylogeny is further corroborated by a molecular phylogenetic analysis of cyto- chrome b based on four sequences (637 base pairs in length), representing two distinct haplotypes for Heliotrygon gomesi. Parsimony analysis produced a single most parsimonious tree revealing Heliotrygon and Paratrygon as sister taxa (boot- strap proportion of 70%), which together are the sister group to a clade including Plesiotrygon and species of Potamotry- gon. These unusual stingrays highlight that potamotrygonid diversity, both in terms of species composition and undetected morphological and molecular patterns, is still poorly known. Potamotrygon limai, sp. nov., is described from the Jamari River, upper Madeira River system (Amazon basin), state of Rondônia, Brazil. This new species differs from congeners by presenting unique polygonal or concentric patterns formed by small whitish spots better defined over the posterior disc and tail-base regions. Potamotrygon limai, sp. nov., can be further distinguished from congeners in the same basin by other characters in combination, such as two to three rows of midtail spines converging to a single irregular row at level of caudal sting origin, proportions of head, tail and disc, patterns of dermal denticles on rostral, cranial and tail regions, among other features discussed herein. Potamotrygon limai, sp. nov., is most similar to, and occurs sympatrically with, P. scobina, and is distinguished from it by lacking ocellated spots on disc, by its characteristic polygonal pattern on posterior disc, a comparatively much shorter and broader tail, greater intensity of denticles on disc, more midtail spine rows at tail-base, and other features including size at maturity and mer- istic characters. Potamotrygon limai, sp. nov., is also distinguished from other species of Potamotrygon occurring in the Amazon region, except P. scobina, by presenting three angular cartilages (vs. two or one). This new species was discov- ered during a detailed taxonomic and morphological revision of the closely related species P. scobina, and highlights the necessity for thorough and all-embracing taxonomic studies, particularly in groups with pronounced endemism and mor- phological variability. Authors: William T. White mail, Keisuke Furumitsu, Atsuko Yamaguchi. Recent taxonomic and molecular work on the eagle rays (Family Myliobatidae) revealed a cryptic species in the northwest Pacific. This species is formally described as Aetobatus narutobiei sp. nov. and compared to its congeners. Aetobatus narutobiei is found in eastern Vietnam, Hong Kong, China, Korea and southern Japan. It was previously considered to be conspecific with Aetobatus flagellum, but these species differ in size, structure of the NADH2 and CO1 genes, some morphological and meristic characters and colouration. Aetobatus narutobiei is particularly abundant in Ariake Bay in southern Japan where it is considered a pest species that predates heavily on farmed bivalve stocks and is culled annually as part of a ‘predator control’ program. The discovery of A. narutobiei highlights the paucity of detailed taxonomic research on this group of rays. This discovery impacts on current conservation assessments of A. flagellum and these need to be revised based on the findings of this study. A new species of wedgefish, Rhynchobatus immaculatus sp. nov., is described from a small collection of specimens ob- tained from fish markets in northern Taiwan. It is probably a medium-sized species (probably attaining ca. 1.5 m TL) be- cause the largest known specimen, an immature male (ca. 1 m TL), has prolongated dorsal and caudal fins typical of adult wedgefishes. Rhynchobatus immaculatus is unique within the family in having a very high vertebral count (within the range of 165–170 total free centra) and in lacking a dark pectoral marking. Other Rhynchobatus species occurring in Tai- wanese seas appear to attain a larger adult size, possess a dark pectoral marking at least in young, and have lower vertebral counts (fewer than 161 total fee centra). Rhynchobatus yentinesis, which was described from a specimen taken nearby at Wenzhou, China, has not yet been attributed to a currently recognised species. However, based on the illustration of the holotype, which reveals a broad-snouted species with a dark pectoral spot, it is closest to either R. palpebratus or R. springeri. Authors: Ebert, David A.; Cailliet, Gregor M.
A new species of sawshark, Pristiophorus nancyae sp. nov., is described from eight specimens collected off mozambique. The new species is the second member of the family pristiophoridae and first member of the genus Pristiophorus described from the western indian ocean. The new Pristiophorus species can be distinguished from the sympatric occurring six-gilled sawshark, Pliotrema warreni regan, 1906, most notably by having five paired gill openings as opposed to six. The new species is distinguished from all other Pristiophorus species by several distinctive characteristics. most notably, the new species differs by having a very distinctive double row of four to five conspicuous large pits anterior to the nasal barbels on the underside of its snout. other distinguishing characteristics include a broad, triangular first dorsal fin with a rear tip that extends behind the pelvic midbases, barbels much closer to mouth than snout tip, two rows of enlarged pits on the underside of the pre-barbel rostrum, ridges on the base of its large lateral rostral teeth, mostly tricuspidate, flat, imbricated lateral trunk denticles, and plain color pattern. The new species is compared to the five other known Pristiophorus species and a revised key to the genus is presented. Four new skates of the genus Notoraja Ishiyama, 1958 are described from the rarely accessed, deep waters off New Caledonia, Vanuatu and Fiji islands, and the Norfolk Ridge. Three of these (N. alisae n. sp., N. longiventralis n. sp. and N. fijiensis n. sp.) are “velcro skates” which are characterised by their velvety dorsal and ventral surfaces, covered with fine denticles. Although similar in shape, they differ by their colour pattern, dermal armature, development of the lateral tail folds, and size of the pelvic-fin anterior lobe and nasal curtain. The description of the fourth species, Notoraja inusitata n. sp., is based on a juvenile male exhibiting some unusual features resembling those of other skate genera. A new whipray, Himantura randalli sp. nov., described from material collected off Bahrain, Kuwait and Qatar, appears to be endemic to the Persian Gulf. It has been frequently confused with forms of the more widely distributed whipray Himantura gerrardi Gray and other presently unidentified species from the Indian Ocean. Himantura randalli sp. nov. is distinguished from these species by a combination of characters, i.e. disc shape, morphometrics, squamation (including its rapid denticle development and denticle band shape), plain dorsal disc coloration, and whitish saddles on a dark tail in young. It is a medium-sized whipray with a maximum confirmed size of 620 mm disc width (DW) and a birth size of around 150–170 mm DW. Males mature at approximately 400 mm DW. Himantura randalli sp. nov. is relatively abundant in the shallow, soft-sedimentary habitats of the Persian Gulf from where it is commonly taken as low-value or discarded bycatch of gillnet and trawl fisheries. Published online on 26. January 2012. A new species of softnose skate (Arhynchobatidae) is described, based on a single adult male measuring 895 mm TL that was collected at a depth of 953–1,022 m on the Coriolis Bank off western New Caledonia in the southwestern Pacific Ocean. The specimen conforms to the genus Bathyraja in having the rostral cartilage continuous with the neurocranium and very slender and uncalcified over its length. Bathyraja leucomelanos sp. nov. differs from its congeners through a combination of the following characters: distinctive coloration of the disc with white dorsal and black ventral surfaces, dorsal surface of the disc entirely covered with dermal denticles, ventral surface naked, anterior portion of the anterior margin of the disc straight, snout long and very broad with orbit about 6.0 times in preorbital length, orbit 0.73 times interorbital width, mouth 6.8% TL, tail 0.88 times precloacal length, accessory terminal 2 cartilage of the clasper having an expanded disc-shaped tip, and alar thorn tip undulating. Molecular barcoding from the COI sequence reveals that this new species is genetically close to B. spinicauda from the North Atlantic Ocean.
" Resurrection of the name Carcharhinus cerdale, a species different from Carcharhinus porosus "
Aqua International Journal of Ichthyology, Volume 17, Issue 1: 1-10.
from the Philippine Islands "
JONATHAN H. WALSH, DAVID A. EBERT and LEONARD J.V. COMPAGNO. A new species of angel shark, Squatina caillieti sp. nov., is described from a single specimen collected in deepwater off Luzon in the Philippines. The new species is closest to S. formosa and S. nebulosa, but differs from its congeners based on the following characters: unfringed barbels with rod-like tips, upper lip arch semi-oval in shape, large papillae present on the inside posterior margin of the spiracles, a greater interspiracle space than interorbital space, pelvic fin-tips which reach the first dorsal origin, a short pelvic fin base, short pelvic inner margin very short, and a short pelvic posterior margin; pelvic girdle span more than 1.4 times greater than head length; dorsal fins angular, greater interdorsal space than dorsal caudal space; caudal fin lobed, very short upper postventral caudal margin. The new species is the only Squatina confirmed as occurring in the Philippines. We also comment on the biogeography of western North Pacific Squatina and provide a revised regional key to this group. its description, the only other published reports of this species are of specimens from Somalia. This paper reports on H.
globally. A re-description of H. quagga is also provided based on the recent Indian specimens. restricted to the western Indian Ocean (Compagno et al., 2005). very rarely occur as bycatch in shark fisheries of India. Arabian Sea are erroneous (Human, in prep.). 1Pacific Shark Research Center, Moss Landing Marine Laboratories, 8272 Moss Landing Road, Moss Landing, CA 95039, USA. A new species of chimaera, Chimaera notafricana sp. nov., is described from specimens collected off the west and south coasts of southern Africa. The new species is distinguished from its closest congener, the eastern North Atlantic Chimaera monstrosa, by a combination of morphometric characters and coloration: pectoral fin when depressed reaches to origin of pelvic fin base; caudal fin ventral margin terminating slightly posterior to caudal fin dorsal margin insertion; distance from anterior base of dorsal-fin spine to center of supratemporal canal short (6.5–14.8% HDL); pelvic claspers externally trifid and short (12.1–12.3% BDL), divided for distal one-third of length, not extending past distal tip of pelvic fins; uniform blackish brown with dark bluish streaking, precaudal tail with longitudinal light and dark stripes. This new species has a restricted distribution from Lüderitz, Namibia to south of Algoa Bay, Eastern Cape Province, South Africa. Authors: Kemper, Jenny M.; Ebert, David A.; Didier, Dominique A.; Compagno, Leonard J.V. A new species of chimaera, Hydrolagus melanophasma sp. nov.
(Chondrichthyes: Chimaeriformes: Chimaeridae), from the eastern North Pacific. members of the genus Hydrolagus including H. alphus, H. colliei, H.
melanophasma from the Gulf of California. California, Mexico, and into the Gulf of California. A new frilled shark species was discovered in African waters. David Ebert and Leonard Compagno. from the slopes of the Norfolk Ridge (South-West Pacific)". Banded wobbegong elevated to species status. 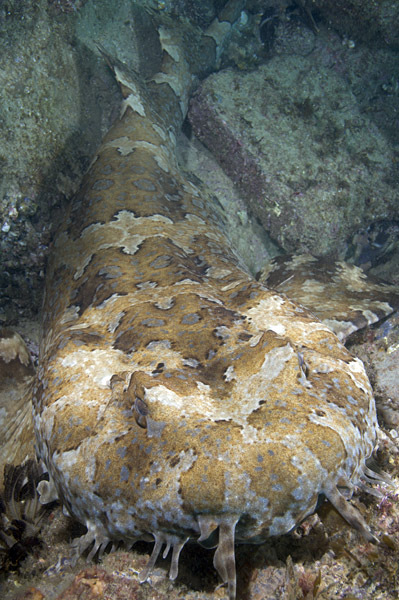 The Banded wobbegong Orectolobus halei (originally described by Whitley in 1940) has been redescribed by Huveneers in 2006. It was previously considered to be the adult form of the Ornate Wobbegong Orectolobus ornatus. Bangkok, Thailand – A new species of freshwater stingray has been discovered in a river in western Thailand, but its chances for long-term survival are slim, warns WWF. The new species of stingray, measuring 60 centimeters (23.6 inches) in width, was first observed two years ago but has only now been confirmed in detail as a new species by researchers from WWF Thailand and the US-based Smithsonian Institute. WWF Thailand’s Senior Freshwater Biologist, Dr Chavalit Vidthayanon, along with Smithsonian Research Associate Dr Tyson Roberts, have described in detail the new freshwater stingray, known as Himantura kittipongi, found in the Mekong Basin of western Thailand. Thai rivers, including the Mekong River where the ray is found, have been plagued by serious pollution, overfishing and dam building, which have taken a deadly toll on Thailand's once diverse and abundant river life. The ray is believed to exist in only small numbers. The new species was named Himantura kittipong after prominent Thai fish expert Kittipong Jaruthanin who first observed the ray in 2004.
shark in the southeastern Atlantic. world because fins are believed to have aphrodisiacal and medical benefits. locally and around the world, suggesting a separate species. populations of the scalloped hammerhead,'' Shivji said. imperil both the scalloped hammerhead and the new species. waters also could increase the risk of extinction of the cryptic species. . .
would be lumped with the other large coastal sharks. Meanwhile, Shivji said, more research is required to count and describe it. MEXICO CITY - A Mexican marine biologist has discovered a new shark species in the murky depths of Mexico's Sea of Cortez, the first new shark find in the wildlife-rich inlet in 34 years. Postgraduate student Juan Carlos Perez was on a fishing boat in early 2003 studying sharks from the Mustelus family netted at depths of 660 feet (200 meters) when he noticed some of them had darker skin and white markings. The sharks, slender, dark gray-brown and around 5 feet (1.5 meters) long, turned out to be a new species that Perez and his team have named "Mustelus hacat," after the word for shark in a local Indian dialect. "What I first noticed was their color. They are dark in color, like dark coffee, and have white markings on the tips and edges of their fins and tails which jump out at you because they are so dark," Perez told Reuters on Thursday. "I got back from the boat and the first thing I said was that I thought I had a new species, but I wasn't sure until six months on when we did genetic tests," he said, audibly elated. Perez studied around 40 of the sharks from 2003 to 2005. Worldwide, marine biologists tend to discover two or three new shark species in any given year. But Perez's find -- bringing to five the types of Mustelus shark found in the eastern North Pacific -- is the first shark discovery in the Sea of Cortez since the tiny Mexican Horn Shark (Heterodontus mexicanus) was identified in 1972. "I wasn't looking for something new, but it's very satisfying. I'm very happy," said Perez, 31, who is based at the CICESE science and technology research center at the port of Ensenada in northwestern Baja California state. His find was published in the US journal Copeia in December. "There must be more undiscovered species there but access is difficult. If we hadn't been on those boats I'd never have seen them because that's the only place they are caught. And it's not a region that attracts scuba diving." There are some 50 to 60 species of shark in the Sea of Cortez, a narrow body of water also known as the Gulf of California that separates Mexico's Baja California peninsula from the mainland and is famous for its rich and unique ecosystem. The Mustelus hacat lives in the ocean's depths feeding on shellfish and shrimp," Perez said, adding: "They have very, very small teeth. They are really not aggressive or dangerous." The new fish Hemigaleus australiensis, which is a member of the Carcharhiniformes family Hemigaleidae, is known from inshore bays on the continental shelves of northern Australia and lives in water up to 170m/557’ deep. Its closest relative, H. microstoma, commonly known as the the Weasel shark or Sicklefin weasel shark, is a small and slender species roughly the same shape and size as the Smooth hound sharks, Mustelus spp. native to UK waters, which reaches around 1m/39” in length. For more details on the new shark species see the paper: White, WT., Last, PR. and JV Compagno (2005) – Description of a new species of weasel shark, Hemigaleus australiensis n. sp. (Carchariniformes: Hemigaleidae) from Australian waters. Zootaxa 1077: 37-49. A new species of marine stingray has been described from the waters of the Indo Malay archipelago. The new fish, which has been named Pastinachus solocirostris, has just been described by Peter Last, Mabel Manjaji and Gordon Yearsley in a paper in the systematics journal Zootaxa. Pastinachus solocirostris is a member of the Dasyatidae family and sits in the Order Mylobatiformes. The genus Pastinachus was previously considered to be monotypic, with a single representative species, P. sephen, occuring across a wide area of the Indo Pacific from the Red Sea to China. However, recent studies have found a number of distinct fishes in the genus and it seems likely that many names that have previously been placed into synonymy will be raised to specific status once again. The new ray was discovered in Indonesia and Malaysian Borneo but appears to occur mainly in muddy waters and estuaries off Borneo and Sumatra. Unlike other members of the genus, P. solocirostris has a smaller adult size, a more elongate head and disc shape, fewer pectoral fin radials and vertebrae and a sting closer to the end of its tail. For more details on the new stingray species see the paper: Last, PR., Manjaji, BM and GK Yearsley (2005) - Pastinachus solocirostris sp. nov., a new species of Stingray (Elasmobranchii: Mylobatiformes) from the Indo-Malay Archipelago. Zootaxa 1040: 1-16.